As a contribution toward preparing the United States for a future in which Artificial Intelligence (AI) plays a growing role, we survey the current state of AI, its existing and potential applications, and the questions that are raised for society and public policy by progress in AI. We also make recommendations for specific further actions by Federal agencies and other actors. A companion document called the National Artificial Intelligence Research and Development Strategic Plan lays out a strategic plan for Federally-funded research and development in AI. AI has applications in many products, such as cars and aircraft, which are subject to regulation designed to protect the public from harm and ensure fairness in economic competition. How will the incorporation of AI into these products affect the relevant regulatory approaches? In general, the approach to regulation of AI-enabled products to protect public safety should be informed by assessment of the aspects of risk that the addition of AI may reduce alongside the aspects of risk that it may increase. If a risk falls within the bounds of an existing regulatory regime, moreover, the policy discussion should start by considering whether the existing regulations already adequately address the risk, or whether they need to be adapted to the addition of AI. Also, where regulatory responses to the addition of AI threaten to increase the cost of compliance, or slow the development or adoption of beneficial innovations, policymakers should consider how those responses could be adjusted to lower costs and barriers to innovation without adversely impacting safety or market fairness. Currently relevant examples of the regulatory challenges that AI-enabled products present are found in the cases of automated vehicles (AVs, such as self-driving cars) and AI-equipped unmanned aircraft systems (UAS, or “drones”). In the long run, AVs will likely save many lives by reducing driver error and increasing personal mobility, and UAS will offer many economic benefits. Yet public safety must be protected as these technologies are tested and begin to mature. The Department of Transportation (DOT) is using an approach to evolving the relevant regulations that is based on building expertise in the Department, creating safe spaces and test beds for experimentation, and working with industry and civil society to evolve performance-based regulations that will enable more uses as evidence of safe operation accumulates. Government also has an important role to play in the advancement of AI through research and development and the growth of a skilled, diverse workforce. 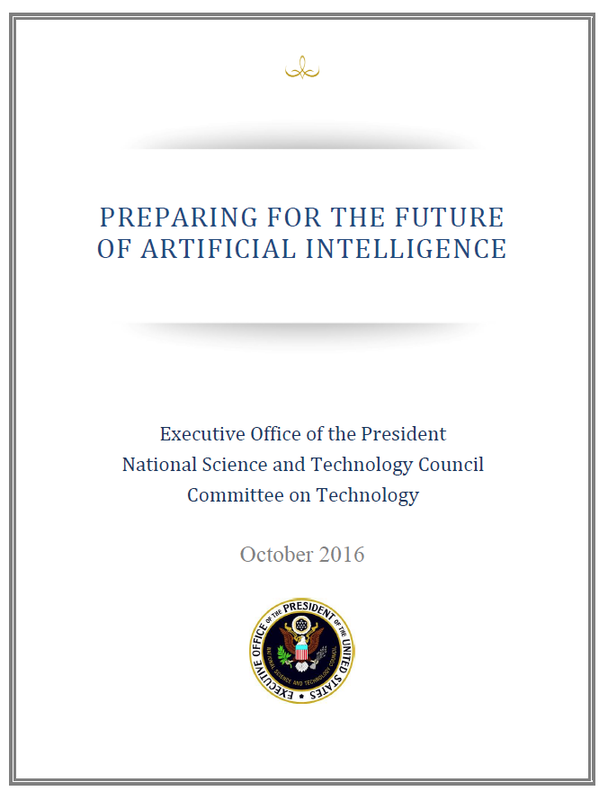 A separate strategic plan for Federally-funded AI research and development is being released in conjunction with this report. The plan discusses the role of Federal R&D, identifies areas of opportunity, and recommends ways to coordinate R&D to maximize benefit and build a highly-trained workforce. Given the strategic importance of AI, moreover, it is appropriate for the Federal Government to monitor developments in the field worldwide in order to get early warning of important changes arising elsewhere in case these require changes in U.S. policy. The rapid growth of AI has dramatically increased the need for people with relevant skills to support and advance the field. An AI-enabled world demands a data-literate citizenry that is able to read, use, interpret, and communicate about data, and participate in policy debates about matters affected by AI. AI knowledge and education are increasingly emphasized in Federal Science, Technology, Engineering, and Mathematics (STEM) education programs. AI education is also a component of Computer Science for All, the President’s initiative to empower all American students from kindergarten through high school to learn computer science and be equipped with the computational thinking skills they need in a technology-driven world. AI’s central economic effect in the short term will be the automation of tasks that could not be automated before. This will likely increase productivity and create wealth, but it may also affect particular types of jobs in different ways, reducing demand for certain skills that can be automated while increasing demand for other skills that are complementary to AI. Analysis by the White House Council of Economic Advisors (CEA) suggests that the negative effect of automation will be greatest on lower-wage jobs, and that there is a risk that AI-driven automation will increase the wage gap between less-educated and more-educated workers, potentially increasing economic inequality. Public policy can address these risks, ensuring that workers are retrained and able to succeed in occupations that are complementary to, rather than competing with, automation. Public policy can also ensure that the economic benefits created by AI are shared broadly, and assure that AI responsibly ushers in a new age in the global economy. As AI technologies move toward broader deployment, technical experts, policy analysts, and ethicists have raised concerns about unintended consequences of widespread adoption. Use of AI to make consequential decisions about people, often replacing decisions made by human-driven bureaucratic processes, leads to concerns about how to ensure justice, fairness, and accountability—the same concerns voiced previously in the Administration’s Big Data: Seizing Opportunities, Preserving Values report of 2014,1 as well as the Report to the President on Big Data and Privacy: A Technological Perspective published by the President’s Council of Advisors on Science and Technology in 2014.2 Transparency concerns focus not only on the data and algorithms involved, but also on the potential to have some form of explanation for any AI-based determination. Yet AI experts have cautioned that there are inherent challenges in trying to understand and predict the behavior of advanced AI systems. Use of AI to control physical-world equipment leads to concerns about safety, especially as systems are exposed to the full complexity of the human environment. A major challenge in AI safety is building systems that can safely transition from the “closed world” of the laboratory into the outside “open world” where unpredictable things can happen. Adapting gracefully to unforeseen situations is difficult yet necessary for safe operation. Experience in building other types of safety-critical systems and infrastructure, such as aircraft, power plants, bridges, and vehicles, has much to teach AI practitioners about verification and validation, how to build a safety case for a technology, how to manage risk, and how to communicate with stakeholders about risk. At a technical level, the challenges of fairness and safety are related. In both cases, practitioners strive to avoid unintended behavior, and to generate the evidence needed to give stakeholders justified confidence that unintended failures are unlikely. AI poses policy questions across a range of areas in international relations and security. AI has been a topic of interest in recent international discussions as countries, multilateral institutions, and other stakeholders have begun to access the benefits and challenges of AI. Dialogue and cooperation between these entities could help advance AI R&D and harness AI for good, while also addressing shared challenges. Today’s AI has important applications in cybersecurity, and is expected to play an increasing role for both defensive and offensive cyber measures. Currently, designing and operating secure systems requires significant time and attention from experts. Automating this expert work partially or entirely may increase security across a much broader range of systems and applications at dramatically lower cost, and could increase the agility of the Nation’s cyber-defenses. Using AI may help maintain the rapid response required to detect and react to the landscape of evolving threats. Challenging issues are raised by the potential use of AI in weapon systems. The United States has incorporated autonomy in certain weapon systems for decades, allowing for greater precision in the use of weapons and safer, more humane military operations. Nonetheless, moving away from direct human control of weapon systems involves some risks and can raise legal and ethical questions. The key to incorporating autonomous and semi-autonomous weapon systems into American defense planning is to ensure that U.S. Government entities are always acting in accordance with international humanitarian law, taking appropriate steps to control proliferation, and working with partners and Allies to develop standards related to the development and use of such weapon systems. The United States has actively participated in ongoing international discussion on Lethal Autonomous Weapon Systems, and anticipates continued robust international discussion of these potential weapon systems. Agencies across the U.S. Government are working to develop a single, government-wide policy, consistent with international humanitarian law, on autonomous and semi-autonomous weapons. with thoughtful attention to its potential and to managing its risks. The U.S. Government has several roles to play. It can convene conversations about important issues and help to set the agenda for public debate. It can monitor the safety and fairness of applications as they develop, and adapt regulatory frameworks to encourage innovation while protecting the public. It can provide public policy tools to ensure that disruption in the means and methods of work enabled by AI increases productivity while avoiding negative economic consequences for certain sectors of the workforce. It can support basic research and the application of AI to public good. It can support development of a skilled, diverse workforce. And government can use AI itself to serve the public faster, more effectively, and at lower cost. Many areas of public policy, from education and the economic safety net, to defense, environmental preservation, and criminal justice, will see new opportunities and new challenges driven by the continued progress of AI. The U.S. Government must continue to build its capacity to understand and adapt to these changes. As the technology of AI continues to develop, practitioners must ensure that AI-enabled systems are governable; that they are open, transparent, and understandable; that they can work effectively with people; and that their operation will remain consistent with human values and aspirations. Researchers and practitioners have increased their attention to these challenges, and should continue to focus on them. Developing and studying machine intelligence can help us better understand and appreciate our human intelligence. Used thoughtfully, AI can augment our intelligence, helping us chart a better and wiser path forward.